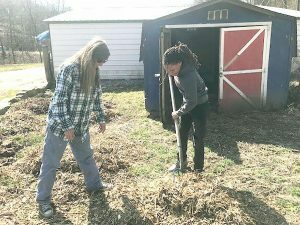 Missy Burdette, left, and Fairmont hip-hop artist TK Blockstar work Sunday just outside Barrackville at Burdette’s Emerarld Farms. BARRACKVILLE, W.Va. — Standing together at Emerald Farms Sunday, Fairmont hip-hop artist TK Blockstar and Missy Burdette unveiled their vision for a community garden at the site. Located just past Barrackville on the Husky Highway, Blockstar plans to bring the community garden to life this year at Burdette’s farm.